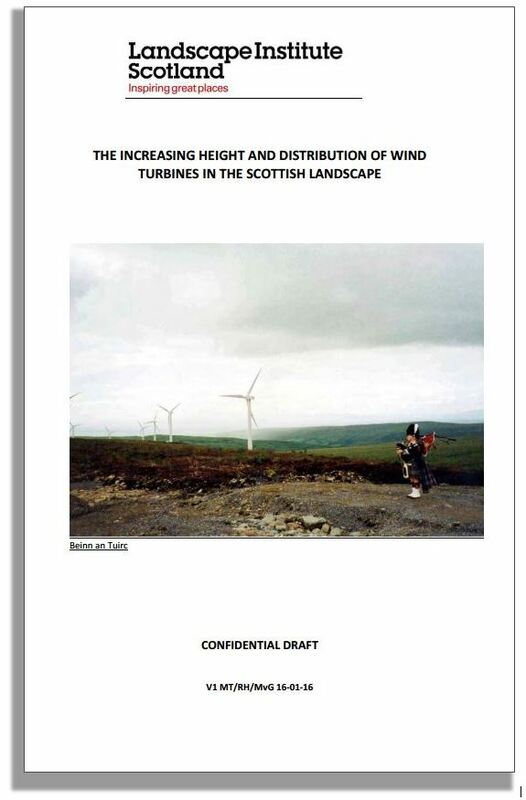 The Landscape Institute Scotland recently emailed members regarding a Confidential Consultation Draft of the LIS Report on ‘The Increasing Height and Distribution of Wind Turbines in the Scottish Landscape’. The report is based on discussions during a meeting held in Stirling on 25th June 2015 and consultation comments received on the record of this meeting. It has taken considerable time and effort from Rebecca Hughes, LIS Policy Officer, Marc van Grieken, LIS Committee Support and Mark Turnbull, LIS Chairperson to work through contributors comments and attempt to arrive at a consensus, given the very broad range of views expressed. We are now anxious for comments on this Draft from LIS members who attended the meeting and those who were unable to attend but who wished to be involved. LIS was recently invited to participate in the Scottish Government Working Group: Onshore Wind – The Next Phase. The Working Group is organised and chaired by Debbie Harper from the Scottish Government, who has asked to see a copy of the Draft Report. The report has been provided to her on the strict understanding that it is Draft which members have yet to comment on and the final report may be subject to change. Following the consideration of comments and feedback from LIS members the Final Report will be circulated to SNH, the other participants of the Working Group, relevant Scottish Ministers, as well as other interested parties. In making your comments your views on wider circulation are welcomed. Getting our views heard is important and this document will be a good way of extending our influence and increasing our profile as a profession.